This is an Ottoman Turkish style name. 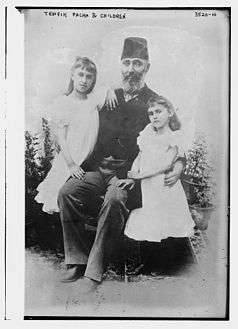 Ahmet Tevfik is the given name, the title is Pasha, and there is no family name. Wikimedia Commons has media related to Ahmed Tevfik Pasha. Ahmet Tevfik Pasha (Ottoman Turkish: احمد توفیق پاشا‎‎; 11 February 1845 – 8 October 1936), known as Ahmet Tevfik Okday after the Surname Law of 1934, was the last Grand Vizier of the Ottoman Empire. He held the office three times, the first in 1909 under Abdul Hamid II, and from 1918 to 1919 and from 1920 to 1922 under Mehmed VI during the Allied occupation of Istanbul. 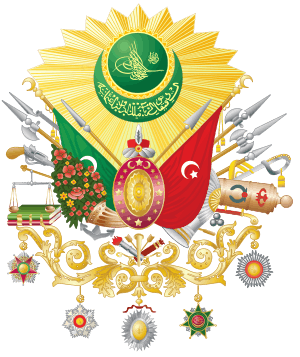 In addition to his premiership, Ahmet Tevfik was also a diplomat, a member of the Ottoman Senate, and the Minister of Foreign Affairs. 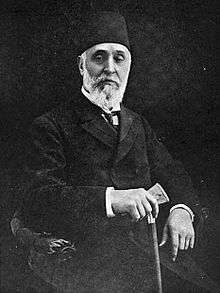 Ahmet Tevfik was born on 11 February 1845 in Istanbul. His father, Ferik Ismail Pasha, was a Crimean Tatar descended from the Giray dynasty. Ahmet Tevfik entered military service but left after becoming a junior officer, entering government bureaucracy training. After 1872, he held various foreign ministry posts. After serving as an ambassador in Rome, Vienna, St. Petersburg, and Athens, he served as the Ottoman chargé d'affaires and ambassador to Germany in Berlin from 1885 to 1895. After returning to Istanbul, he served as the Minister of Foreign Affairs (Turkish: Hariciye Nazırı) from 1899 to 1909. After the proclamation of the Second Constitutional Era in 1908, Ahmet Tevfik Pasha was appointed to a seat in the revived Senate of the Ottoman Empire (Turkish: Ayan Meclisi), the upper house of the also-revived parliament, the General Assembly (Turkish: Meclis-i Mebusan). After World War I and the resignation of Ahmet Izzet Pasha, Ahmet Tevfik Pasha was again appointed grand vizier on 11 November 1918. Two days after his term began, the Allies began their occupation of Istanbul. The Allies pressured sultan Mehmet VI to dissolve parliament on 21 December 1918, and for a few weeks, Ahmet Tevfik Pasha's government was dissolved as well. He formed his government again on 12 January 1919, but after the invaders forced him to dissolve it once more, he resigned as grand vizier on 3 March 1919. After his second term as grand vizier, Ahmet Tevfik Pasha became the head of the Senate of the Ottoman Empire (which had not yet been dissolved, unlike the lower house). He then served as the president of the Ottoman delegation to the Paris Peace Conference ending World War I. Ahmet Tevfik Pasha's delegation refused the heavy terms of the proposed treaty, but another delegation sent by the Grand Vizier Damat Ferit Pasha accepted the terms and signed the Treaty of Sevres. 1 2 3 Kalyoncu, Cemal A. "Son Sadrazamın Torunu." Aksiyon 20 Nov 1999: n. pag. Son Sadrazamın Torunu. Aksiyon.com.tr, 20 Nov 1999. Web. 1 Sep 2013. <http://www.aksiyon.com.tr/aksiyon/haber-5552-son-sadrazamin-torunu.html>. "Tewfik, Ahmed, Pasha". Encyclopædia Britannica (12th ed.). 1922.